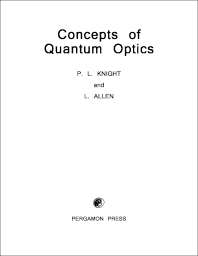 Concepts of Quantum Optics is a coherent and sequential coverage of some real insight into quantum physics. This book is divided into six chapters, and begins with an overview of the principles and concepts of radiation and quanta, with an emphasis on the significance of the Maxwell's electromagnetic theory of light. The next chapter describes first the properties of the radiation field in a bounded cavity, showing how each cavity field mode has the characteristics of a simple harmonic oscillator and how each can be quantized using known results for the quantum harmonic oscillator. This chapter also deals with the quantum fluctuations of the radiation field and the interpretation of a photon as an occupation of a normal mode of the system. These topics are followed by discussions of the radiation absorption and emission and the principles of coherent state and coherence functions. The final chapter considers the concept of semi-classical theory and its connection to quantum electrodynamics. This book is of value to undergraduate and postgraduate students who are starting research in laser physics or quantum optics.